Get Ready for a Powder Day! The storms keep coming and I am not mad about it! Our friend Joel Gratz from Open Snow is predicting another BIG storm to roll through the northern mountains tonight and into Thursday morning. He is calling for 10-15 inches in the surrounding area with over 16” predicted at Vail and 15” at Beaver Creek. The extended forecast looks promising with moderate snow predicted from Thursday night through Saturday. The snow will be amazing but the temperatures are expected to be well below 0F, so wear lots of extra layers. YIPPIEEE! Need a Vacation? 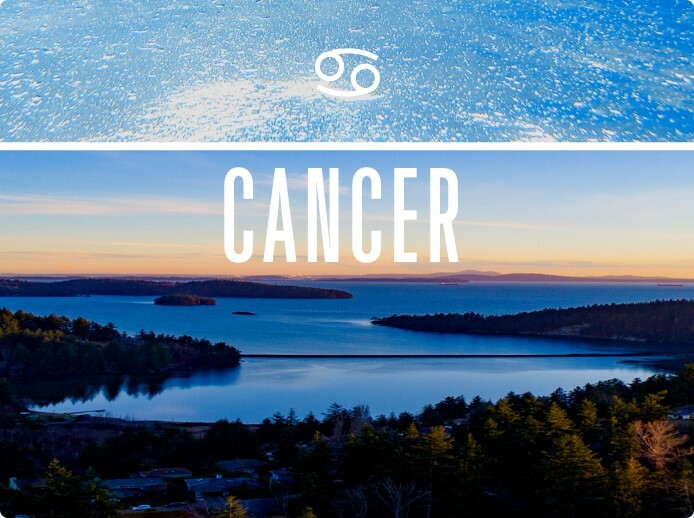 Let your travel horoscope inspire your next trip! VRBO put together a guide to help you pick your next vacation destination. 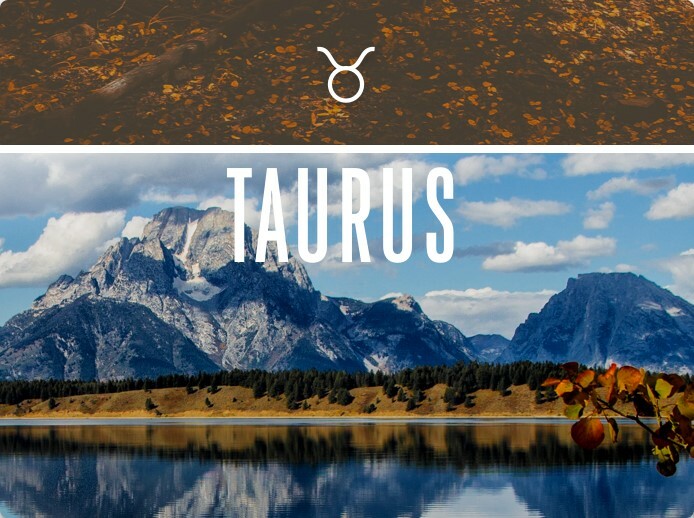 Where will your birth sign be taking you? You’re intense, dude! The trick is to find a getaway challenging enough to satisfy your rugged drive that also forces you to relax and marvel at the natural world. You yearn for adventure this fall. Mental thrills, cool sights, you name it, you must explore. And it’s gotta be in a boredom-free zone. Perish idle thoughts! You work crazy-hard. It’s time to unplug. No need to get too far outta your zone — too laid-back or too remote. A small town with big design appeal is the right move. Despite being naturally mellow, you’re a sensitive, compassionate sort who requires a reboot to refill your tank. Retreat to a calm, daydreamy place by the sea. You’re gonna take charge on vacay like every day. You’d never settle for simply lazing around a pool, so don’t even front. Say "hey" to a bustling paradise instead! It’s time to bask in the glory you provide for others without expending tons of effort. Find a dramatic landscape in a luxe setting and soak it all up. Impulse-control issues aside, you’re the good kind of adrenaline junkie! Go where your spontaneous spirit will encounter endlessly interesting places and people. Take a step back from the stress. Find a chill place by the shore to recharge and treat yourself to the TLC you’re always doling out to everyone else. A whimsical creature like you needs serene, transcendent scenery this season. Nothing less than magical forest vibes will do. I admit, I am not that savvy or superstitious when it comes to Zodiac Signs but I confess to quickly glancing at my horoscope while flipping through the Vail Daily. Sometimes they are incredibly timely and accurate and other times it might call for a 5-star day when I have already spilled my coffee on my white blouse while taking a corner a little too hot on I-70. I am sure many of you have the same views on astrology as I do, but a recent article on Apartment Therapy was too entertaining not to share (especially for my Millennial friends)! Free-spirited and unconventional, Aquarius would love the unique homes found in Key West, FL with bold, playful colors and decorative wooden elements. 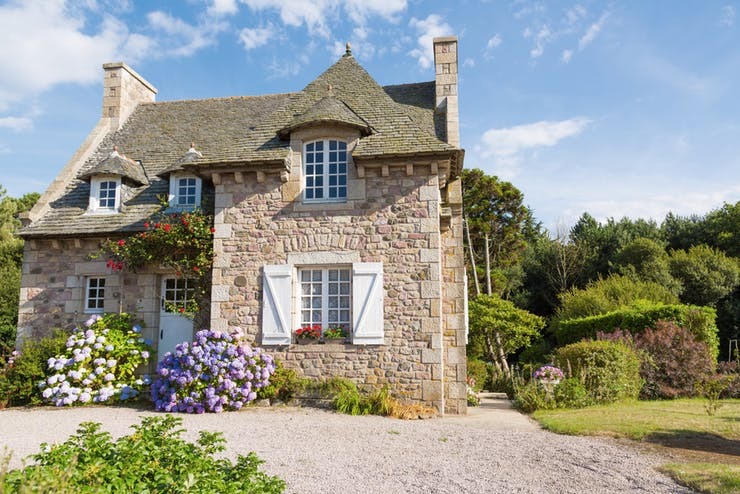 Hovering between fantasy and reality, Pisces would be inspired by the estates in the French countryside. They are full of soft romantic touches but incredibly practical and well-made. Bold, ambitious, and full of joie de vivre, Aries will feel at home in a colorful Mediterranean home highlighting balconies, porticos, and ornate details like multicolored tiles. Taurus enjoys relaxing in serene, rural settings, making Prairie architecture a perfect fit. Classic features made famous by Frank Lloyd Wright and his contemporaries include lots of windows to let the outside in and horizontal lines mimicking the landscape. Gemini tend to be intellectually curious and aren't afraid to try something new - so were the pioneers of mid-century modern architecture. This forward-thinking style utilized new materials and focused on open spaces, flat planes and clean lines. Sensitive Cancer thrives in cozy spaces that feel safe and comfortable. Cottage style homes inspired by the dwellings of European peasant farmers are quaint and inviting with curving front walkways and lush florals. Leos are natural leaders who enjoy the spotlight, and the dramatic Tudor style is sure to draw just enough attention. These homes boast contrasting facades and steeply-pitched, multi-gabled roofs. Logical and practical Virgos are the ideal fit for ranch-style homes. this post-World Warr II design was created with practicality in mind, featuring attached garages, open-floor plans and easy-outdoor access. Passionate and powerful Scorpio appreciate the imposing form of Greek Revival architecture, which gives the impression of wealth with tall columns and pediments, as well as bold embellishments and moldings. Sagittarius tend to be adventurous and love to travel, so a home inspired by far-off lands are right up their alley. The hallmarks of this style are clay roof tiles, arched corridors, arcaded porches, and bell towers. Sometimes perceived as cold and unemotional, Capricorn appreciae the no-frills appeal of contemporary architecture. Many homes of this style champion eco-friendly practices, which pair well with Capricorn being an earth sign. I have to be honest, I was thinking of friends, family and loved ones born in each month and had a little chuckle. I am an Aries and my husband is a Virgo...I'd say we are a great balance! CLICK HERE for the full article from Apartment Therapy and remember, always take your horoscope with a grain of salt. Finding a property that checks off 100% of your wish list items is pretty rare, especially in our current low-inventory real estate market. One of my favorite parts of touring properties with Buyer's is opening their eyes up to the possibility of reworking a space to make it suit their needs. Sure, everyone would love to design their dream home from the ground up but transforming an older space to fit your lifestyle is also a fantastic option. 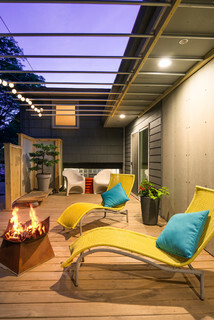 HOUZZ highlights this perfectly in their Before and After’s stories on www.houzz.com. 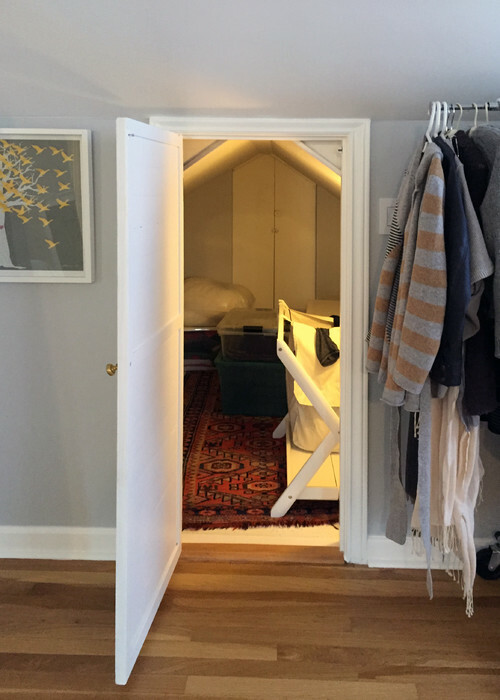 Here are some highlights from their most recent post about a Seattle couple who transform an attic closet into the en-suit master bathroom of their dreams. There was a lot of work to be done to transform the old closet into an en suite bathroom, but the designers also saw a lot of potential. This side of the house faces east, giving the homeowners a view of Lake Washington and an abundance of morning sunlight. The existing bedroom was large but not functional. Space under the eaves was wasted, and parts of the attic were still unfinished. “We find that when you are working with constraints, such as dormers, brick facades, tight spaces, it is an opportunity to create a unique space,” says project manager Alev Seymen. 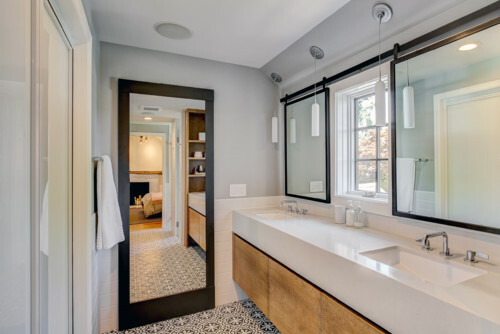 A bright and open bathroom replaces the once closed-in closet. The design team extended the existing gable along the front of the house to match the footprint of the first floor, recapturing vertical space that was lost under the eaves. 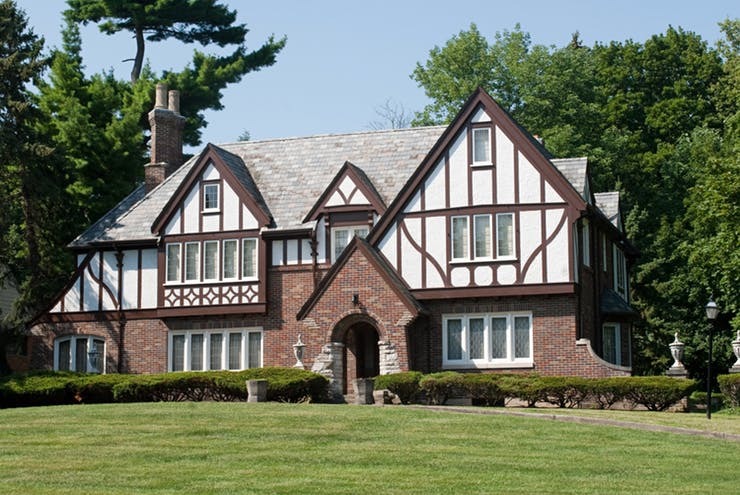 The new peaked dormers fit in with the Tudor’s original character, looking as if it was built this way from the start. Sometimes a little goes a long way. Minimalism is quickly becoming one of the most popular trends in home décor and luxury real estate, with homeowners abandoning their ornate tastes for spaces with a more streamlined aesthetic. Clean and modern design radiate throughout each of the following properties and show that true luxury can be understated and refined. It is August 8th and our local grocery store already has Halloween costumes out! 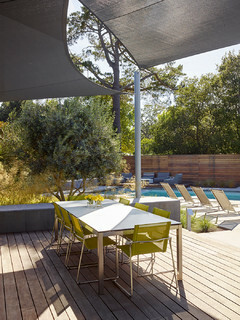 For those of you who do not want to let go of summer for at least another month or two, here is a great article from Houzz talking about the latest trends in outdoor living! 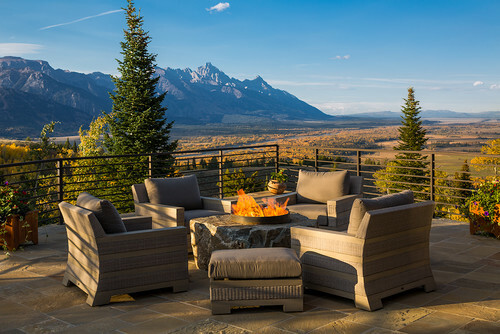 Gauged Frontier stone from Montana is an apt choice for this Jackson Hole, Wyoming, terrace because it blurs the lines between the architecture and the surroundings. With a design like this and a spectacular view of the Grand Tetons, it’s easy to see why so many Houzzers are drawn to this photo. Look for local or regional materials to best blend a terrace or patio into the landscape. This deck and pool area offers shady and sunny spots thanks to contemporary charcoal gray sail shades. This modern take on the trellis accentuates the architecture of the house and provides a spot to hang magical outdoor globe lights. 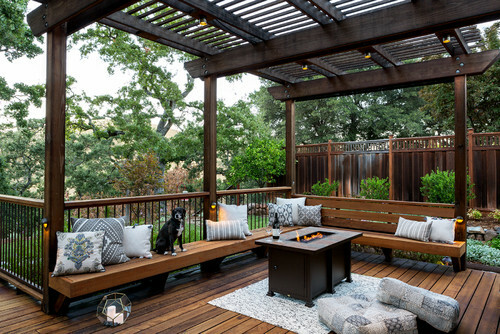 Similar to the previous photo, a substantial trellis defines this outdoor living room on the deck. But another important trend represented here is built-in deck furniture. 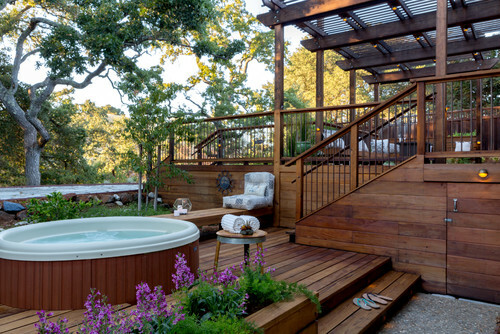 This can make a small deck feel more expansive than free-standing furniture and maximize your deck’s seating potential. While these benches float, others we’ve seen have built-in storage beneath them to keep cushions clean and dry. If you have the space, consider building several levels for the deck. Here, it helps the transition from conversation areas to lounging areas. And this one delineates the levels even more by using different materials on the deck. Long boards emphasize the area you traverse, while a more rhythmic composition sets the tone in the sitting area and turf adds a relaxing element in the sunbathing area.